Posted on June 29, 2017 . by Patrick Johnstone. Leave a comment. The long days of summer mean long council meetings. On June 26, we had a lengthy open workshop during the day on Water Conservation measures, which I will blog about at some other time (add it to the now quite lengthy queue), and the evening meeting began with a presentation of our Annual Report, where you can see what the City has been up to, financial statements and all. Staff have been working on an updated Sign Bylaw for some time, and it has finally gone through stakeholder consultations with everyone from the ACTBiPed (to discuss how signs impact the pedestrian realm) to the various BIAs and Chamber (because we are talking about business regulations here). We received no written submissions on the Sign Bylaw and no-one came to speak on the matter. In the Council meeting following, Council moved to give the Bylaw Third Reading. This OCP amendment and zoning bylaw will allow the development of a small (5-unit) affordable housing project to be developed on City lands in Queensborough. We received no written submissions on this item, but had two people speak on the issue – a representative from the not-for-profit that will operate the facility and a person with a pretty negative impression of Queensborough. This project is a small but important step forward for the City. The City is donating land to encourage the development of supportive housing for people at the sharp end of our regional affordable housing crisis. In this case, WINGS will provide family-friendly housing to women with children who have barriers to market housing. The location is on the newly-designed and pedestrian friendly Ewen Avenue, 200m from a park, 400m from schools and the Queensborough Community Centre, in a family friendly neighbourhood. Council moved to give the OCP amendment and rezoning Third Reading. This DVP would permit some changes to the existing zoning approval for the empty parking lot between the Fraser River Discovery Centre and Pier Park, and facilitate the building of two large towers on the waterfront. We received 14 pieces of correspondence on this project (both for and against), and 6 people came to speak to the project, a couple expressing concerns, a couple in favour. This is a big project, the biggest development project I have had to opine on during my time on Council, and there has already been much social media buzz about it, including some pretty significant factual errors being perpetuated by persons who should know better, so I’m not going to comment on this here, but will write a follow up-up blog post about it. Council moved to approve the DVP. The Esso station in Uptown is changing the branding of its convenience store, and although the new 7-11 sign is smaller than the existing signage, the change does not fit the language of our Sign Bylaw, so a variance is required. No-one came to speak on this variance, and Council moved to approve. This variance makes some changes to a development in Port Royal to make some top floor suites larger, and allow for rooftop mezzanines. The variance is to allow the building to be higher than zoned to facilitate those mezzanenes. The variance does not increase density or FSR, but does significantly improve the livability of the suites to be built – family friendly three-bedroom suites, with minimal impact on surrounding properties, and is supported by the Design Panel. No-one came to speak to the variance, and it was approved by Council. This variance is to allow a homeowner in the West End to exceed their allowable “ground cover” by 4% to permit a pool in their backyard. Apparently pools are considered “accessory buildings” in the bylaw. Who knew? We received a couple of pieces of correspondence form neighbours who were in support of the variance, and the proponent came to speak on it. The variance is minor for the purpose of limiting ground cover, and there is little to no impact on adjacent properties. Council moved to approve the variance. The City limits the use of commercial space for religious assembly, for several good urban planning reasons. However, there is a small group on 12th Street who are building their congregation while provide community connection for a growing immigrant population. They do not have a place for prayer, and wish to use their community space for this on a temporary basis (maximum three years) until they can find a properly zoned assembly space. Aside from one offensive, ignorant, racist and grammatically-challenged (why do those things always go together?) piece of correspondence, we received no public comment on this. Council moved to permit the Temporary Use. The OCP document is completed. Along with a new Land Use Map, the OCP includes 182 proposed actions to be taken by the City over 61 Policy areas towards 12 goals. There is a lot in here, and it is worth reading. This is culmination of three years of work by staff and the most extensive public engagement exercise ever undertaken by the City. As this OCP will be going to Public Hearing on September 18th, I will hold any more comments until then. Please enjoy your summer reading assignment, and I will see you in September! The following item was Moved on Consent. A Local Area Service is usually when a group in the community come forward to ask for special works to be done to improve their neighbourhood that is not in the City’s Capital Plan. Depending on the works and by City policy, the City will either share the cost of the works with the proponents, or will bill the proponents for all of the cost. To activate a Local Service Area, the impacted property owners have to vote to approve the special assessment to cover their part of the costs. This neighbourhood in Queensborough is asking to have their electrical service put underground, which also requires the other users of the poles (Shaw and Telus) to re-locate their service. This is the start of the process to determine if the residents are in favour of the costs. Back in April, this Council agreed to make a “concrete and actionable commitment to the Truth and Reconciliation Commission calls to action”, and staff has responded swiftly with a framework of how the City can respond to the 19 Calls to Action that fall completely or partially within Local Government jurisdiction. This is a significant step, and as a City, New Westminster is entering into new areas here, and are (frankly) lacking in full understanding of what the long-term implications may be. I agree with a somewhat cautious approach because I am concerned we will do more damage than good if we barge ahead without having a well-informed conversation about what we are doing. Staff is putting together a working group of management to go through the recommendations, and determine what the best path forward is from an operational perspective. Council moved to endorse the strategy, with the addition that the working group engage, as a consultant, someone with experience in reconciliation from the indigenous viewpoint to sit in on these meetings so they are there to provide context where they feel it may be needed. I am a believer that RAs serve an important role in our community, both in facilitating conversation between residents and City Hall, and in bringing neighbourhoods together. Some do have a difficult time finding space to meet (a problem that will be exacerbated by the Library upgrades that will close the meeting spaces there for several months) and volunteers are sometimes expected to cover the modest costs of making RAs operate. I am not opposed to providing modest funding to RAs to allow them to run a web page, print posters to promote their events, etc. however, I am concerned that not all RAs have the proper procedures in place to manage public money, and though the amounts are small, there is a diligence requirement for the City when handling public funds. Council did not approve special granting for RAs, but expressed general support for the idea. Instead, we asked that the RA Committee work with staff on some criteria and guidelines for the finding and bring a better developed plan together for how these funds would be allocated and used. A renoviction storm is brewing in New Westminster. For people in a couple of older (and more affordable) rental buildings, the summer will be spent trying to find new places to live in an increasingly tight rental market (vacancy is well below 1% in NewWest), and will likely find the cost of any new place they find is much higher than they are paying now. This situation is made much more difficult for people living in poverty (moving costs a lot of money! ), people with families (family-friendly apartments are hard to find), those with pets, or those with disabilities (vacancy for accessible suites is almost nil). The laws of the land limit what Cities can do to prevent renoviction. Demovictions are somewhat easier to manage as the City has zoning power to delay or prevent approvals for replacement buildings that are larger than current ones, and can therefore leverage this to get a tenant relocation plan from a developer. Unfortunately, we don’t have that power when zoning is not invoked (like extensive renovations), and cannot unfairly withhold building permits for renovation of buildings. The City has three-prong attack on this issue right now. We are empowering our staff to take careful review of the building permit applications they receive to determine if eviction is required (or if this is just a cosmetic upgrade designed to drive up rent more than the Residential Tenancy Act allows). We can use our staff resources to reach out to buildings where evictions will be occurring to make sure tenants are aware of their rights, their access to the Residential Tenancy Board to adjudicate their concerns, and supportive services in the community they may need to re-locate (such as the newly-established Rent Bank). We can also lobby the Provincial government to change the residential tenancy act to provide more protection for renters facing renoviction, and to provide compensation to renters to help offset the costs and inconvenience of eviction. The City is doing all three. Ultimately, the solution will be found in building more rental stock to improve availability and (hopefully) put some downward pressure on rent costs, in providing greater housing diversity, and in working with the province to build supportive and non-market housing alternatives for those simply priced out of our stupid housing market. The City is also doing these. Finally, we arrived at our Bylaws section of the evening. As discussed above, the City’s OCP Bylaw was given two readings. A Public Hearing on the OCP will be held on September 18, 2017. Enjoy your summer reading assignment! As discussed at the May 15th meeting , this Bylaw that adjusts the fee for using the City’s dance spaces was given three readings. As discussed at the June 12th meeting, this change to the meeting procedures for the APC was adopted. Please adjust your behavior accordingly. As discussed at the June 12th meeting, this Bylaw that extends some borrowing terms in the existing Borrowing Bylaw adopted. It’s now the Law of the Land. Next meeting in on July 10th. Enjoy the sunny weather and Canada Day, everyone. Posted on June 17, 2017 . by Patrick Johnstone. 1 Comment. The City held a Public Hearing on the introduction of a Heritage Conservation Area for Queens Park last Tuesday. To no surprise, the Public Hearing was long, as both advocates for and opponents of the HCA had turned up in force at previous Council Meetings to delegate on the topic, and feeling in the community were strong on this issue. I have spent much of the last couple of months talking to people about this issue, and acting like the Devil’s Advocate on both sides, challenging the assumptions of both supporters and opponents. I have done this not to be a jerk, but because I needed to find a way to understand the arguments and concerns of each side. I have received more than 200 e-mails (and have tried to respond to them all – still working on that!) and more written correspondence, and have answered the occasional irate phone call. I have had conversations with people in the community who have not initially expressed an opinion one way or the other. Councillor Trentadue and I spent some time doorknocking in Queens Park to get a feel for what people (especially those without lawn signs) know, what people’s concerns are, and where the support and opposition lie. I have met for coffee with strong supporters and vocal opponents of the policy. As such, not much that I heard at the Public Hearing was a surprise to me. The purpose of a Public Hearing is for me to listen, not for me to challenge or debate the delegates. I heard a few things I strongly disagreed with, and I heard a bit of bad information, but mostly I heard people concerned about the future of their neighbourhood and about the future of their homes. To my mind, the challenge the City had was to develop a policy that did its best to address those concerns. The HCA policy that was approved by Council is not perfect, but I believe we found a moderate approach that balanced individual and community desires. The HCA was not something I thought I would be supporting when I ran for Council. This was something that the community brought to Council, and right from the start more than four years ago (when the Queen’s Park Neighbourhood Heritage Study Working Group was put together), bringing in measures to protect heritage homes in Queens Park has been an initiative driven by the neighbourhood, supported by staff, and endorsed along the way by Council. The inference by a few that this was a top-down Council-driven initiative is untruthful. When the Working Group brought recommendations to Council a little more than a year ago, it was the first time I was faced with the idea that we may institute an HCA, and I have had a lot to learn in the year since. The first question may seem like the easy one, but it isn’t. Supporters of the policy provided many reasons to support the protection of heritage homes, and even most opponents acknowledged that “they love heritage”. However, few made the argument (which I think is a valid one) that Queens Park style heritage homes are perhaps a luxury that the lower mainland can no longer afford, given the ongoing and worsening housing crisis. During the process, a few of us on council have made clear that the HCA policy cannot stop all development, infill density, or other ways of increasing housing choice in the Queens Park neighbourhood. We need to accelerate our work towards increasing laneway and carriage house infill, stratification of large houses if they wish to re-configure into multi-family buildings, and protecting the multi-family housing stock that already exists in Queens Park. The HCA as adopted will not prevent that progress, and I look forward to our work on the OCP and new Zoning Bylaws to address these issues. However, at the risk of feeding the “elitist” narrative, Queens Park is unique in New Westminster, and in the Lower Mainland. A neighbourhood of 700 homes where 500 of them are pre-WW2 represents a significant heritage asset in a province that only has 160-odd years of Colonial history. The heritage value of the neighbourhood has been acknowledged for almost 20 years, with progressive increases in heritage protection, an active heritage conservation community, and voluntary design guidelines since 1999. There are heritage homes in every neighbourhood of New West, but not at this concentration across a neighbourhood, and there has never been any concerted effort from those neighbourhoods to formalize heritage protection like there has been in Queens Park for more than 20 years. The second question is where most of the conversation has occurred for the last year, and this is where the vocal opposition to an HCA has helped the City develop a better, more flexible, and more sustainable policy. One commenter noted that Council voted unanimously for this proposal, demonstrating “group think”, but one can only surmise that if they have not been paying attention for the last year. Since the recommendation from the working group was adopted, there have been a dozen Council meetings and workshops where various aspects of this policy were discussed and debated. There were motions moved, ideas tossed around and sent back to staff for more work, there were split votes and motions defeated, and at one meeting, something akin to an argument of fundamental principles of the policy. If we got to consensus at the end of this process, it is a credit to the hard work of staff and the community members on the working group to forge a policy that all could live with. That more than 2/3 of the correspondence and presentations to Public Hearing also spoke in favour of the policy further reflects the great work staff and the community did to develop a strong policy package. The policy will also not mean the end of demolitions and new construction in Queens Park. Houses younger than 1940 have no increased protection, and there are many pre-1940 houses that will be shown to not have sufficient heritage character or structural integrity to protect. The new design guidelines are “performance based”, meaning they don’t prescribe any specific architectural style. This means architects will still be able to develop creative designs that complement the neighbourhood. There will still be debate in the neighbourhood about aesthetics, and things will continue to evolve, but the process at City Hall will be transparent and defensible. In that sense, I think we have achieved a good balance. Finally, I do want to acknowledge that this process brought out many people’s passions, yet the discussion was incredibly respectful and civilized. New Westminster lived up to its reputation as an engaged community that cares about issues and shows up to voice opinions, but we are a community first. Change (I recognize that preserving heritage is a somewhat ironic form of “change”) is hard. We often see the worst case as the likely case, and that is scary. However, if you want to go to 180:30 at the Public Hearing video, you will hear an elegant presentation by Jeffery Dresselhuis that left me wondering if he was “for” or “against” the HCA, until I realized his presentation was about the importance of community, consultation, and consensus in public policy. It is worth listening to, and something I will be thinking about for some time. Posted on June 16, 2017 . by Patrick Johnstone. Leave a comment. This is part 2 of my (partial!) report from the annual meeting of the Federation of Canadian Municipalities (Part 1 is here). One of the tours that was really valuable for me was of the Centre Sportif Gatenau. This relatively recent (2010) sports complex in one of Ottawa’s Quebec suburbs was useful to tour at a time that some of the more detailed design decisions are being made in New Westminster around the Canada Games Pool and replacement of the Arenex. The CSG had a natatorium that I suspect is close to the volume of water and pool types that we are hearing is desired for New West from the stakeholders and public engagement. They have a 52m 8-lane pool with a moveable floor on one half to increase use flexibility, and a second warmer leisure/wellness pool that may not have as many “fun”activities as some community pools, but did provide a small length swimming area to increase flexibility. They also had a one of the larger diving complexes in a diving-centric community (towers to 10m and paired springboards for synchronized diving) that are probably beyond the needs here in New West. One interesting point: the modern standard for BC of emphasizing gender neutral and family changing areas is not the standard in Quebec. Their relatively small family-oriented change area is restricted to those 9 and under when accompanied by a parent. I assume that people needing assistants or care providers are also accommodated, but there was little to be seen indicating this was a standard idea in Quebec. The CSG also had a large three-partition gym complex (it is the home of Canada’s national volleyball team) that is a little larger than is appropriate/affordable for a CGP replacement, but there were some learnings in their state-of-the-art floor treatment (“Terraflex”), and their already old tech lighting (sodium!). A lot can change in 7 years. The CSG also featured a very large (20,000 square feet) gymnastics area. 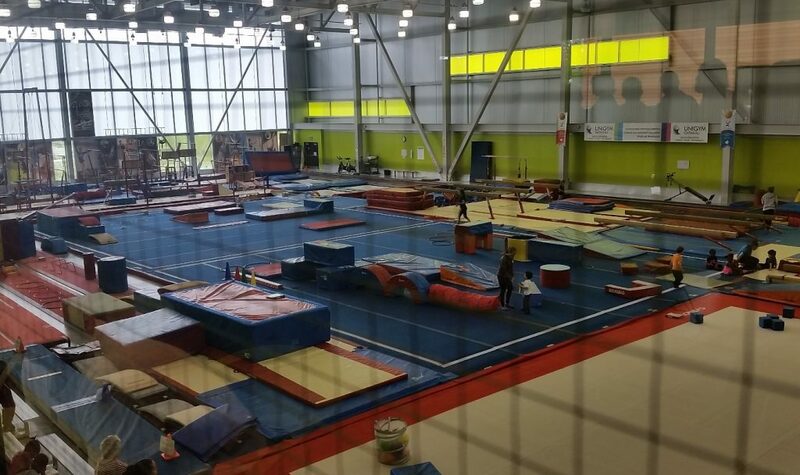 Again, gymnastics are hugely popular in Gatineau, which allows them to program a gymnastics space twice the size of the Arenex. It was an impressive space that helped provide some context to what a space that size can provide, as we look at options for short- and long-term Arenex replacement. Gatineau is a true suburb of Ottawa, and in looking around the CSG area, has all of the stroads, strip mall parking lots, and low-density housing you would expect of an auto-oriented community. There is a Corridor Rapid Bus station adjacent to the facility, a community college to one side and the National Library to the other, yet, they only built 175 parking spots. Parking is free for 90 minutes, but charges are applied for longer periods. There were many, many more details we learned about: what works well and what does not, and about how decisions were made for specific programming. After touring several pools and community centres across the Lower Mainland over the last year, this provided great context to how other regions address similar constraints and desires. We were also fortunate to get a meeting with staff from Infrastructure Canada to discuss opportunities around the new infrastructure funding plan that is being rolled out by the federal government. 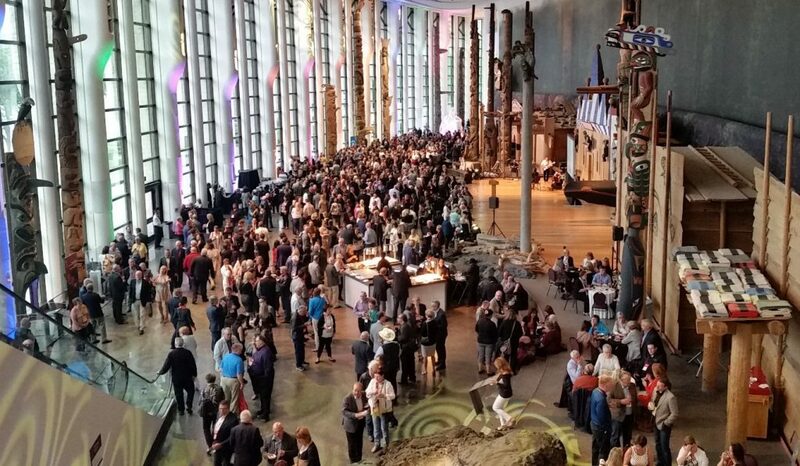 There were a couple of other sessions at the FCM discussing the structure of the grant program, and what the Federal Government will be looking for in projects applying for grants. The plan is long-term (10 years) and the needs across the country are large, but this is an important time for information gathering so we can put the best proposal together when funding windows open. Speaking of funding opportunities, I also attended a session where the FCM’s Municipal Climate Infrastructure Plan grants were discussed. Local governments in Canada own half of all public infrastructure, and are responsible for 60% of public service greenhouse gas emissions. BC is ahead of most provinces on this file (as the first Climate Action Plan under the Gordon Campbell Liberals really pushed Cities towards carbon neutrality), but there is still a lot of work to do, and it was great to learn from the experiences of Cities across the country. It was not lost on this crowd that this talk was occurring the day after President Trump announced his intention to pull out of the Paris Accord, shortly followed by a chorus of state and local government leaders stepping up and saying they were going to lead if the President fails to. 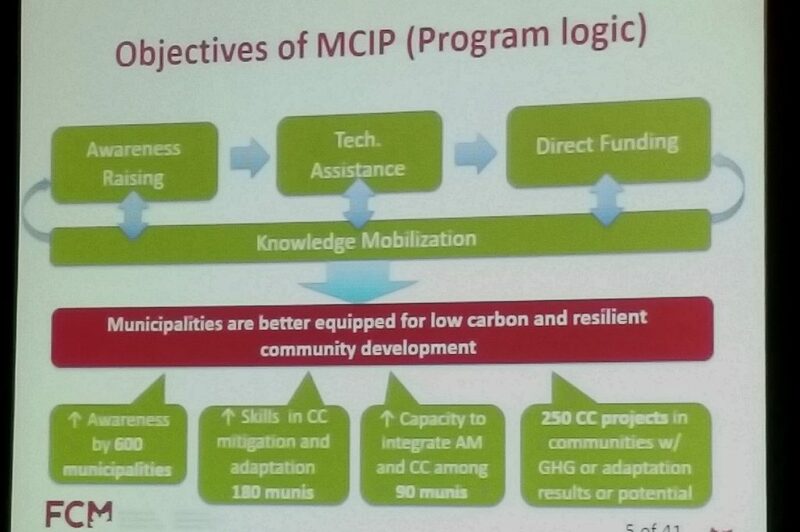 Local governments can, and must, lead on climate mitigation and adaptation. The FCM is doing much to help us do so. Finally, the FCM provided so many opportunities for informal learning. 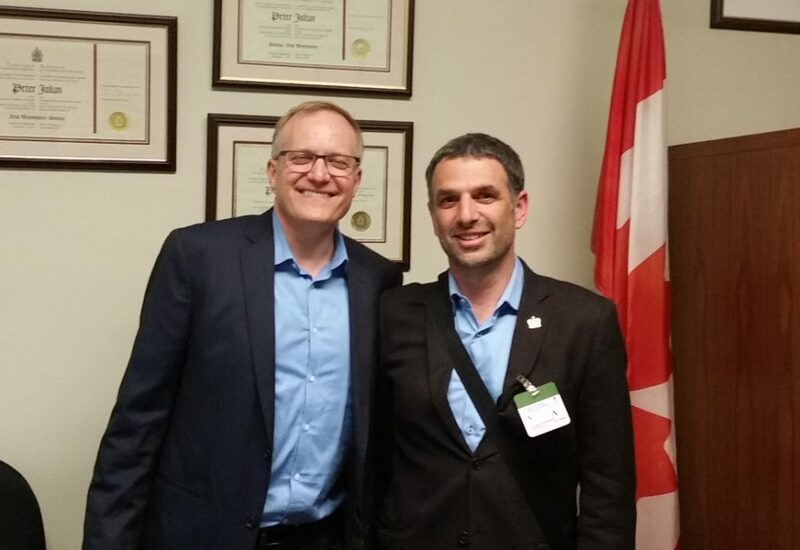 There were networking sessions where I met everyone from a City Councillor representing Kanata who has served for 28 years as Ottawa grew into a tech hub to a young Councillor from a small town outside of Edmonton who frequented New Westminster because his girlfriend actually lives in Moody Park! There is also a significant Trade Fair, where vendors of everything from waste management systems to artificial turf come to show us what is new in public services. I went for a bit of a vacation after FCM, visiting family in Ottawa and friends in Montreal, which led to a bunch of other informal learning about how those Cities work, but I’ll save that for a future blog post. Posted on June 14, 2017 . by Patrick Johnstone. Leave a comment. The June 12th meeting seems so long ago, because the Public Hearing the following day seems to dominate the Council Agenda this week. However, we had a large Agenda, so I’ll get this report out first, and write more on the HCA later. This design for a single family home in Queens Park requires a Development Variance Permit because it is too far forward on the lot (by 7 feet) and too tall to fit in the current zoning (by 2 feet). These variances, however, are a result of the homeowner and staff working together to assure the City meets the Queens Park design guidelines and the construction of the house can accommodate the protection of mature pine trees on the property. The current house was damaged by fire and provided a demolition permit during the Heritage Conservation Period, but their progress in building a replacement has run in parallel with the Heritage Control Period, which has no doubt been challenging for the homeowner and staff. I am not concerned about the height variance, as it is minor, will fit in the context of the area, and provides a more livable secondary suite. The front yard projection is a bigger concern. It is, however, close to the front yard projection of the (restored heritage) house to the north. The house to the south was built quite a bit further back on their lot than the other adjacent houses, and the resident did show u to express concerns about this variance and the impact on their home. We received some correspondence on this Opportunity to be heard, mostly in favour (including from the QPRA), and one opposed from the neighbour to the south. In the end, I was convinced the compromise made by staff and the homeowner balanced the various needs for the site, and Council voted in favour of granting the variance. A contemporary artist has an interesting proposal to activate the historic Simon Fraser bust on the boardwalk, at least to activate it on the geologic timescale sense. She intends to remove a 5-inch slice of the plinth, relocate that piece to the headwaters of the Fraser River, allowing nature to slowly, but inevitably, return the plinth to the lower Fraser River through erosion. The Statue has an interesting history, and this may be an interesting way for the City to call attention to the statue, and re-enlighten a conversation about Simon Fraser, the colonial history of the Fraser River, and what the story of Simon Fraser has to say about New Westminster as a community, and as part of a Gateway. Council voted to support the concept, noting that we need to put this proposal through a bit of a review with impacted First Nations in light of our recent commitment to the principles of reconciliation, but I think just opening this discussion will be a useful step in the right direction. The historic Masonic Hall building is being redeveloped, with a preservation of the historic façade (much like the Trapp building) under a Heritage Agreement from 2014. Unfortunately, some geotechnical issues were discovered during excavation and foundation work that will require an engineering response to preserve the structural integrity of the façade wall. The required reinforcement will take away 3 parking spaces. The owners are further requesting a change in balcony design to create a better profile and building envelope. I’m not concerned about either change. The balconies are a design choice that is not fundamental to the HAP and the loss of three parking spaces in a dedicated rental building within a 200m of a SkyTrain Station in our compact downtown should not be a deal-breaker. This is the formal agreement between the City (as landowner) and the operator of a small Affordable Housing project in the east end of Downtown. The City is working on a plan to use an empty City lot in Queensborough for a medium-sized childcare facility, recognizing the critical need for childcare in that neighbourhood. The plan has many details, including the requirement for an OCP amendment to allow this institutional use on a residential-zoned lot. Public consultation is beginning on this project, and it will go to Public Hearing in the Fall. Density Bonuses are cash payments made to the City by developers to allow increased density with new developments. These are regulated by the Local Government Act, and are generally earmarked to provide amenities wanted by the City. In New West, we divide up that cash this way: 30% towards affordable housing (like the Hastings Street project above), 10% towards child care (like the Queensborough project above), 10% towards public art and 50% towards general amenities like parks, civic facilities, and public realm improvements. The City has not adjusted its Density Bonus rates since 2014, and the value of newly built density has increased 30% – 60% in that time (depending on the building type and location). This increase, and comparison to adjacent markets like Burnaby and Coquitlam suggests our density bonuses should go up between 50% and 140% in this accelerating market. This will require a zoning amendment Bylaw, which will see some stakeholder consultation. The tower being constructed at Plaza 88 will include a structural apron to stop things being dropped on the tracks and direct noise from the Skytrain away from residential areas. This work can only be done when the train is not running, which means at night, which requires a variance from our noise bylaw. About as small an administrative change as one can make to a Committee Procedure Bylaw, but a change it is recommended we make to clarify voting procedures for the APC. This follows up on the report we received on May 15th regarding the 2017 Homelessness Count. After a few years where it looked like the region was beginning to reduce the rate of homelessness, there was a sharp spike in numbers this year. There are many factors here generally grouped under the “housing affordability crisis”, but we are also seeing reduced senior government support for people at risk of becoming homeless. Despite the work we are doing in New West (arguably more than any other City in the region on a per-capita basis), we will not be successful without a regional response and senior government funding. Through the adoption of this resolution, the annual UBCM meeting in September gives us an opportunity to lobby the Provincial government to provide these supports. Here is the last piece of official financial reporting for the 2016 fiscal year. It includes a list of how much I got paid (and my expenses). My expenses are mostly for my participation in UBCM in 2016 (which I reported on here, here, and here) and for my participation in community events as per Council expense policy. Moving from Fiscal 2016 to Fiscal 2017, the City has some ongoing projects in the Five Year Financial Plan that still require debt financing as laid out in the borrowing Bylaw of 2012, which expires in August. This Bylaw does not add to the amount of money borrowed, nor can we spend borrowed money on anything other than what was laid out in the original Bylaw, but only extends the time limit for the borrowing. Moving from Fiscal 2017 to Fiscal 2018, we will soon start on our next budget cycle. This report lays out the budget process and opportunities for public input to the Budget process. There is timeline from now to our May 15, 2018 budget filing date, so you can adjust your council delegation calendar to suit. A good way to start is to look at the part of the report entitled “Budget Principles”. It gives a good idea of the order of priority the City gives to budget decisions, starting with departments benchmarking their level of service and being charged with finding internal efficiencies. Arguably, the “public participation” part of the budgeting process should come earlier and higher on priorities, and I would love to hear examples of the best way to make that input meaningful. A resident came to complain to council last month about a rather un-neighbourly tree on public land adjacent to his garden. Our staff went to look at it, and decided it was indeed worthy of being replaced with something more friendly. I suggest maple. Everyone loves maple. The concession stand and washrooms at Queens Park are aged, barely functional, and due for replacement as per the Queens Park Master Plan. These are really heavily used facilities, and the concession actually turns a small profit. The designed replacement will improve the building, make the washrooms more comfortable and accessible, and will support the adventure playground, petting zoo, and other Queens Park amenities. Another resolution for the City to take the UBCM, this one to ask for support in training Police to include principles of Restorative Justice. As I reported earlier, I attended a session at FCM that discussed the different certification standards that are currently being used across Canada for different types of civic facilities. Previously, Council asked Staff to report on updating our Green Building Policy to determine if our current practice of requiring LEED Gold is still appropriate. I am more convinced than ever that we took a leadership position at the time, but times have changed, and it is time to take a broader review of the numerous standards to determine which works best for each specific project. Part of this report was to approve a high-energy-efficiency approach to the Animal Care facility, and I think that is an appropriate path (and I really don’t want to delay that project). Council moved to support this approach. However, when it comes to a set policy for future buildings in the City, Council moved to hold off on adopting a standard practice until we can have a bit of a more fulsome discussion of how to go about selecting standards. Look for a future Council workshop. The river is rising. Snowmelt was late this year, and much of the snowpack in the Fraser catchment is now higher than average. Again, we do not expect a flood this year, but the forecasters are warning that the river could rise quickly, and will stay higher than normal later into June. New West is beginning to show regional leadership in our MTP in how we address regional congestion issues, and how we are working collaboratively with our neighbouring communities and TransLink to reduce the reliance of Single Occupancy Vehicles. I think that there is a time for a City to show operational leadership in this area. When we set goals for our community, to reduce Greenhouse gasses, to reduce waste, or on any issue, we should expect the City to act like a responsible corporate citizen, and do its part to help the community reach its goals. How we perform our daily commute is a choice that has one of the biggest impacts on our environment, and on the sustainability of our community, and employers have a responsibility to provide access to a variety of commuting options. Free parking is a huge benefit to employees that many employers do not offer, and comes at a significant cost. However, people who choose more sustainable options receive no benefit from their employer. I think that encouraging transit use by our staff is a step in the right direction, and fully support this program as a first step in corporate Transportation Demand Management. I would like to have a more comprehensive discussion of this report, as there is a lot here, so I might leave it for a longer stand-alone blog post. Short version, we have asked staff to outline an enhanced enforcement plan for future water restriction seasons, especially one that ramps up as restriction stages increase. We have also asked staff to go the next step towards piloting residential water metering for single family homes, starting with voluntary users, but not to adopt a larger metering program until at least after Metro Vancouver completes their regional metering study. Finally, a wide suite of water conservation measures were presented in the report from the consultant, and we will hopefully Workshop these measures to go through some more detailed cost-benefit analysis. So we are *starting* to ramp up our conservation measures, perhaps not as fast as some would like, but our pace is being moderated by the economics of the situation. New Westminster was one of several local governments and MFA customers who asked them to consider providing fossil-fuel divested (FFD) investment options. The MFA basically said no, but provided this survey to determine interest in Socially Responsible Investing (SRI). I think we should consider any SRI offered to us, as New Westminster in many other ways invests in social responsibility form our progressive approach to homelessness and our adoption of programs like the Age Friendly City Policy. That said, I am not satisfied with the response on FFD. Their reasoning against providing this option to their members skated around the issues at hand, and could be summed up by saying “providing financial backing to the destruction of the biosphere is the only financially responsible way to act”. I cannot accept that. This is about the future of our communities, and the planet we are leaving the next generation. We, at the local government level, are already at the front line in addressing the cost of climate change, and here we are saying that we cannot afford to invest in a way that takes the financial incentive away from the companies that profit from climate change the most. Again, I cannot accept that the local governments in BC, who are leading the world in climate change mitigation are being asked to find our own destruction. That is a pretty strong damnation of the economic system we are under. The MFA belongs to us, they need to do better. “Access to Transit is 100% the most important consideration on the location” – rarely do we get as clear direction as that from a stakeholder group. There is lots of good info being collected, including some terminology my lame 47-year-old vocabulary misses, but I am enthused that staff are taking such a proactive approach to building what the user group wants. The City is partnering with Telus to improve the small public park area adjacent to the Legion in Uptown. I share Councillor Trentadue’s concerns about how smoking will be managed at this space. Generally, we don’t allow smoking in public parks, but this space is where the customers of the Legion go to have a cigarette, and if there is one exception to a rule, I have to give that exception to our Veterans at the Legion. We are working on the Canada Games Pool and Centennial Community Centre replacement project, and will be reporting out on progress soon, but in the meantime, we may find several synergies in a “temporary” building option to replace some of the Arenex programs (most notably, gymnastics, which need a large space). 24,000 square feet is more than twice the size of the Arenex, and gives us a lot of programing flexibility. We put out a press release about this proposal, read it here. This is just a preliminary report on a proposal to build a larger childcare facility as part of a Heritage Revitalization Project at the Methodist church in Moody Park. Lots of detail to come here, and there will be a Public Hearing, so I’ll save my comments until then. Finally, we wrapped with a series of Bylaw approvals. As discussed above, this Bylaw that changes the terms of Reference for the APC was given three readings. As discussed above, this Bylaw that extends the date of the temporary borrowing Bylaw was given three readings. This Bylaw was given three reading back in 2015, and allows the integration of a Caretaker Suite into a planned industrial building in the West End. Council adopted the Bylaw, the Caretaker can sleep easily knowing she is in full compliance with the law. And, really, that’s all any of us want, isn’t it? Posted on June 6, 2017 . by Patrick Johnstone. Leave a comment. As a member of New Westminster Council, I attended the annual Federation of Canadian Municipalities meeting in Ottawa last week. This is my third year on Council, but my first opportunity to attend FCM. It was a busy time, and I haven’t had time to write blogs about it, but I thought I would spend a post or three sharing a few highlight moments from 4 days of learning and networking. We were fortunate to open the event with a personal tour of the Innovation Centre at Bayview Yards. This is an example of a tech business incubator and network hub. 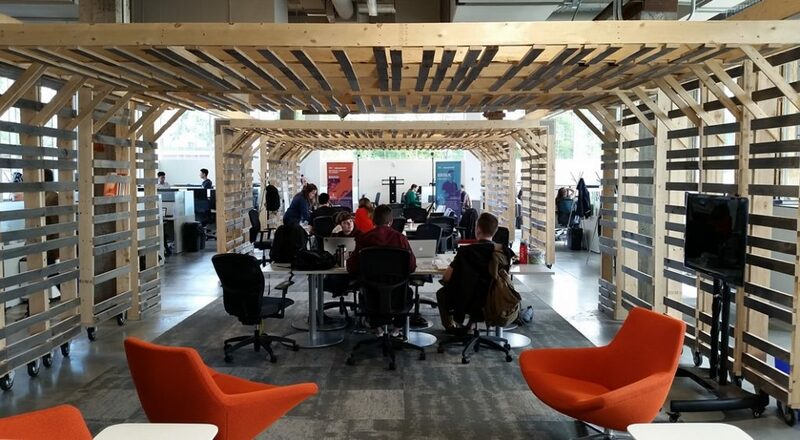 An old industrial building (originally a bus storage and repair terminal) has been converted into a comfortable and lively space where tech startups can share resources and, have direct access to mentors, funding agencies, and angel investors. Ottawa is a unique place when it comes to “tech clusters”: the golden egg-laying goose of every region’s economic plan. Much like Silicon Valley, Ottawa had the right combination of highly trained workforce (a legacy of government research labs, Bell Laboratories, and Nortel), a couple of nearby engineering universities, and access to senior government investors to encourage R&D investment. However, even with all of this, it wasn’t until amalgamation of the 30+ communities that made up greater Ottawa that they started to do economic development in a coordinated regional manner – under the branding of “Invest Ottawa”. The Innovation Centre model operates on Federal and Provincial grant money, and has a well developed mentorship and growth model for start-ups. They travel the world shopping for start-ups, and have a comprehensive screening system to assure applicants selected are those with the best chance at development, and even then not many more than 10% actually grow into a viable business that grows out of the hub (or, more likely, becomes and idea that a larger company buys from the start-up). Still, the return of investment from that small proportion easily created value that outstrips the cost of the facility. We had a lengthy discussion with the general manager, and there was much to learn that was relevant to New Westminster’s IDEA Centre concept, and to how we support and foster tech industries in Greater Vancouver. Not the l east, we need to get past our parochial model of economic development (as you may have heard Greg Moore discussing at this year’s Innovation Week Leadership forum): . Only so much foreign investment out there, we will get swamped unless we lead together. This is a conversation we are planning to continue as we plan next year’s Innovation Week and continue to develop the IDEA Centre. During the FCM, I also attended sessions discussing the building of municipal infrastructure, and how to integrate low-carbon energy systems and environmental resiliency into our design and development process for new buildings. There was a discussion of the many “sustainability” rating systems for new infrastructure, from LEED to Passive House and Envision, and how to determine which of the 8 or 9 common rating systems meets the goals of your project, and the needs of your community. The new North Shore Waste Water Treatment Plant was used as an example of a well-designed review process for rating systems, and a detailed explanation of how the Envision system works for large public infrastructure (where most others are designed for typical residential or commercial buildings). As New Westminster is in a pretty serious infrastructure-building phase (with the new Animal Shelter, Canada Games Pool, District Energy Centre infrastructure, and potential IDEA Centre and Arenex replacement structures), we have already been discussing a review of our existing policy requiring LEED rating for our new buildings, making this comprehensive discussion apropos. On the same day I attended talks on improved Pavement Management Systems work being done at Carelton, and the Smart City Challenge and FCM Innovation network funding opportunities while networking with leaders from communities across Canada learning about their challenges and ideas for making their organizations work better. It was interesting to learn how Milton, Ontario is managing extremely fast growth, and their challenges in funding infrastructure with a very tax-adverse populace, while also learning how the smaller communities are trying to keep up with changing municipal needs as senior government funding seems harder and harder to find. I also managed to squeeze in a tour of the Parliament led by the Hardest Working MP in Canada, who was an excellent host and entertaining tour guide! Posted on June 4, 2017 . by Patrick Johnstone. 3 Comments. You may have heard TransLink is doing a Fare Review process. I wrote a bit about this a few months ago after attending a stakeholders meeting. The next phase of the process is meant to begin in the Fall according to the TransLink webpage, but I recently read a story that brought to mind one of my pet peeves about the transit fare system, and an idea that I think we need to adopt. It is time we stop charging youth for using Transit. I don’t have kids, so this isn’t about me saving money, but I have a couple of close friends in New Westminster who changed their travel pattern once their kids got to paying-for-transit age. At some point, paying for yourself and two others makes transit less desirable when a family can travel together in other modes (car, taxi, rideshare, etc.) at the cost of one person. I would rather that young families be encouraged to ride transit together, for a couple of reasons. First off, it promotes the more sustainable mode, allowing more people to access transit and reduces traffic congestion, travel cost, environmental impact, all of the good things a well-used Public Transit system delivers to a community. The larger benefit, however, may be found in normalizing the use of transit for youth at the time of their life when life-long patterns are established. It sends a message to 6-year-olds when we tell them that being driven by mom or dad to every event is the normal way to travel longer than a walking distance. By making it easy for them to accompany their parent on a bus and the SkyTrain, kids are not only demonstrated that public transit works for many trips, but are also taught how to navigate the City using transit, and to be comfortable in transit situations. This means they will more easily transition to being independent transit users, and will more likely see transit as an alternative when they grow older. Of all the incentive programs that TransLink could put in place to drive ridership, this could potentially have the greatest long-term benefits since the U-Pass program was introduced. It would also, arguably, increase revenue, as more parents would be encouraged to pay a fare that they are now skipping because they have kids in tow, and the kids who are now riding for free are likely to become regular customers when they reach working age. I’m not sure how this would work with our Faregate system (ugh…), nor am I sure if following the example of Toronto and London by making 12 the cut-off age is the right balance. I get the feeling that extending free rides to the age of 18 (essentially, the age students finish High School, and have first access to the U-Pass system) will better meet the public policy goal of “normalizing” transit use. These policy details probably require a better economic analysis than this blog post, and I trust the planners in TransLink to do that work. However, the larger policy idea will have to come from the community asking this of TransLink. For the future of the region, kids and teens should ride for free. Posted on June 2, 2017 . by Patrick Johnstone. 1 Comment. What are the exact details and status for the increased density rezoning plans around the 22nd St. Skytrain Station? Funny you should ask that, we just had a Council Workshop where we discussed the Land Use Map around 22nd Street and Connaught Heights. You can read the Report at this link, and follow the conversation at Council on video here. First off, I need to correct the premise of your question a bit. What the City is doing now is an Official Community Plan update. The OCP is the overarching planning document for the City, which guides how the City develops over the long-term. It will inform how future rezonings are managed, but it is not the same thing as rezoning. There are a few steps between then and now, which I will outline a bit further down. This option would see up to 6 residential towers build on both sides of 7th Ave between 20th and 22nd, with a commercial node built into the pedestals, and the development of 7th Ave into a true commercial street. There would also be multi-unit residential buildings on two adjacent blocks (think 4-6 story wood frame buildings with underground garages) and a general shift to small townhouse developments south of Edinburgh Street. The townhouses are envisioned to be “infill” type, meaning smaller 6-8 unit townhouse (strata) or rowhome (fee simple) developments that will be designed to blend in with adjacent retained single family homes. This is very different than the neighbourhood-wide large townhouse development style we have seen at Port Royal and around Royal Oak Station. Included in the Council Report were summaries of the various stages of public consultation, including the most recent discussions with the Connaught Heights neighbourhood about the proposed density increases. There was a wide range of opinions presented, and some significant concerns raised, but none of them specifically surprising. Traffic, green space, community amenities – these are all things that need to be accounted for when we start to contemplate increased density at the west end of the City. There is also some recognition that previous efforts to bring more density to the area have not been successful. Some of that area has been designated for multi-family since the last OCP was adopted almost two decades ago, and no-one has come in to build that density. This, along with a general lack of housing variety in the Connaught Heights neighbourhood, have resulted in it being the only neighbourhood of New Westminster that had no population growth over the last two censuses. As part of the regional vision of building density around SkyTrain stations and major transportation hubs, this is a place New Westminster is falling short. The proposal by staff to address the issues raised is to start a Master Planning process for the neighbourhood. This is a high-level but relatively intensive planning process where distribution of housing, transportation, commercial spaces, and amenities are designed based on a set of development principles developed by the community. It is not dissimilar from the process that larger development projects like Victoria Hill and Sapperton Green are designed through collaboration between City Staff and a developer. The only difference in this case is that there is no developer involved yet, so the City and the neighbourhood can work fairly freely to create a set of expectations for future developers to meet. 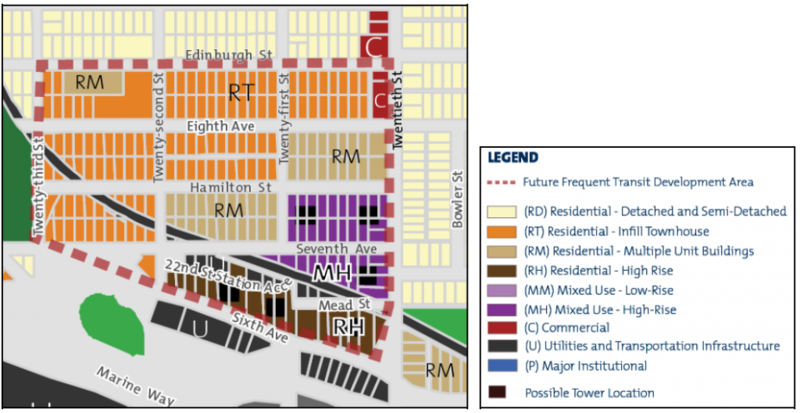 So “rezoning” and density increases at 22nd Street Station are still a bit of a way off, and there will be some significant neighbourhood consultation before any shovels hit the dirt (starting with a Public Hearing in early Fall to facilitate final approval of the OCP). However, the City will, in passing the OCP and launching this Master Planning process, send a pretty strong message that this density is on its way.